You dedicated your career to taking care of others, now it’s time to take care of yourself. 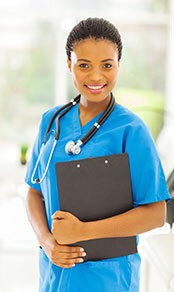 Millersville University’s RN to BSN online program allows Registered Nurses, like you, to complete a BSN at your pace. We provide individualized analysis of your previous credits to ensure the most efficient path to your degree. And you can do it all online, on your time, with a University that’s been educating students since 1855. If you are currently a Registered Nurse in Pennsylvania, you can earn your BSN online while continuing your day-to-day work as an RN. Feel free to call 717-871-7200 or fill out the form below for more information. Be a Star For Breast Cancer Awareness! Accreditation Commission For Education in Nursing, Inc.